Raise a glass in toast to your newlywed status. As the Best Man gets up to make his toast, you and your new husband will have a darling pair of calla lily flutes to raise. 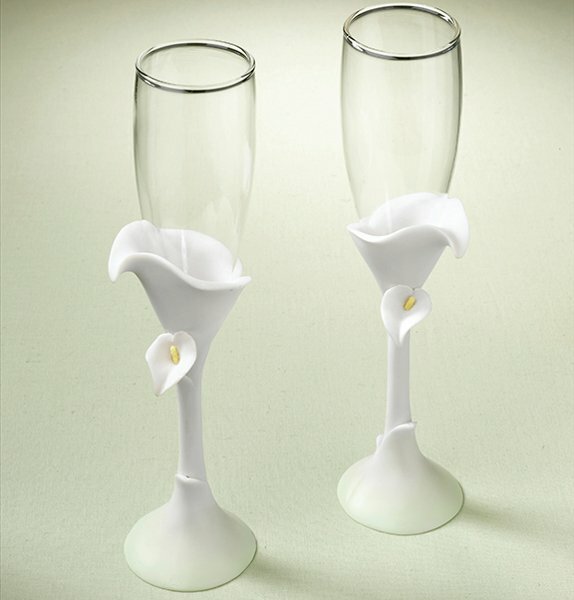 These toasting glasses are festive yet elegant and will blend in well with the real calla lilies at your event. Each toasting glass in this pair stands 9.5" tall. The glass is held by a painted resin base designed to look like calla lily flowers. Use again at home after the wedding is over. Display in a china cabinet and use whenever you want to celebrate your life together. Coordinates with the entire calla lily collection including guest book, pen, cake serving set, ring pillow, pillar and taper holders, candles, and more.